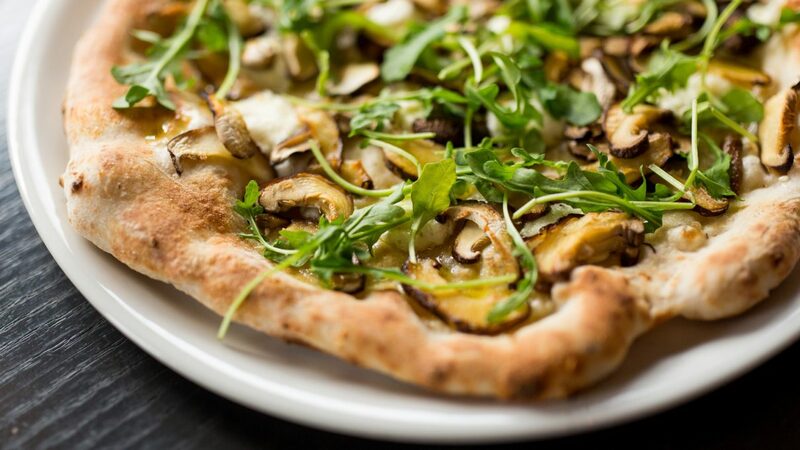 In this humble San Francisco Mission district pizzeria, there’s a slight hush whenever anyone new enters. The quiet persists after the newcomers are seated at one of the dozen or so tables situated in the deep dining room. It’s not totally silent–there’s indie rock soundtrack playing in the background–but mostly, the only sounds are of guests having soft conversations, if they’re talking at all. And the quiet persists even when it’s time to order, when guests pick out their pies by pointing at a two-sided menu while a server stands attentively by. Considering how raucous most pizzerias are, Mozzeria’s subdued atmosphere might seem like a bad sign. Instead, silence is in the very DNA of the business, because everyone working at Mozzeria is deaf. 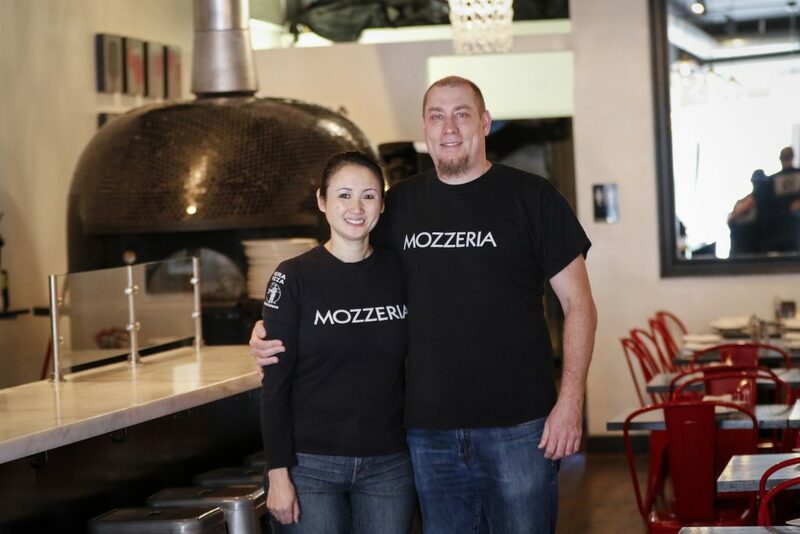 Operated by Russ and Melody Stein, the married owners who opened the popular spot more than five years ago, Mozzeria is California’s first and perhaps only deaf-owned and operated pizzeria. The restaurant specializes in Neapolitan-style individual-serving pies baked to order in a Stefano Ferrera wood-burning oven. The doughy crust, with just a hint of salt, is the perfect canvas for the pizza chefs to put their personal touch on the pies. Fresh salads, housemade desserts, and cold wines by the glass and beers on tap round out the simple but satisfying menu. During a period when the couple was trying to decide on the next phase of their professional lives, Melody spotted a cooking course in Italy and knew what she had to do. She flew out within two weeks, and within months, the seeds were planted for Mozzeria to grow. Today, she manages the restaurant’s day-to-day operations, while Russ handles more of the bookkeeping and bottom line projections. All of Mozzeria’s employees are deaf or hard-of-hearing. “I grew up in an environment where I was introduced to interesting food,” Melody explains. “When I opened Mozzeria [in 2011], I wanted our menu to be a bit distant from our competitors, and for our pizzas to have some Asian influence.” Accordingly, traditional styles such as a tomato, mozzarella, and fresh basil Margherita complement the menu’s more inventive options, such as succulent Peking duck and Hosui pear—evidence of the combined Stein family influences, from childhoods spent in Hong Kong, New York, and California. The pies may be creative, but the business isn’t an improbable departure for Melody, now a third-generation restaurateur. Most of her family members own some sort of restaurant or food-related business. She credits her father, the renowned Bay Area restaurateur Francis Tsai, as her inspiration for wanting to open her own restaurant. Before bringing Melody and her brother to the States to attend the California School of the Deaf, Tsai opened a string of bistros in Hong Kong and Shanghai, including Hong Kong’s first disco after a stint running the food and beverage program at legendary New York club Studio 54. You could say good fun and good food runs in the family. Deaf-owned businesses are not tracked as a category by any government agencies. Until 2009, the now-defunct National Deaf Business Institute maintained a database, which at the time counted more than 600 deaf-owned enterprises in the United States. Some now estimate there may be more than a thousand deaf-owned businesses nationwide, though the task of keeping track falls largely to experts who can intelligently guess at such numbers. If you haven’t experienced it, partial or total hearing loss may not seem as menacing an obstacle as certain physical limitations that might, at first glance, more obviously impact one’s ability to work. But when you consider the tasks required in many entry and mid-level jobs and career tracks, hearing loss can be a significant barrier to entry. That’s why Mozzeria is more important than just the pizzas it serves. By investing time and resources in training people seeking a deaf-friendly work environment, the Steins have made sure that their employees feel personally invested in the restaurant’s success. It’s also basic business acumen. 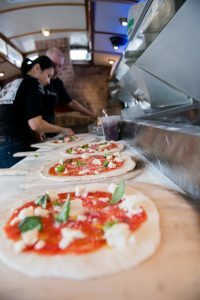 Because they feel personally invested in their work, employee turnover at Mozzeria is low: of the restaurant’s 15 employees, more than half have been there for over a year, a statistic nearly unheard-of in the pizza business. Our employees always wanted to have a chance, but restaurants rejected them immediately once they learned they are deaf. “I think of Mozzeria as a teaching restaurant,” Melody explains. The all-deaf staff is mostly comprised of employees without any traditional restaurant experience; owners of other food service establishments rejected those who tried to get jobs at other restaurants they learned the applicants could not hear. “[Our employees] tell me that they always wanted to have a chance, but restaurants rejected them immediately once they learned they are deaf.” It’s a common, chronic issue in the deaf community. “Deaf people [can struggle] to find a job,” Melody adds, noting those who work for her are happy to have finally found their place. But Mozzeria isn’t just popular with its employees. Customers love it too, and not just the deaf ones: in fact, Russ estimates up to 95% of the pizzeria’s customers are not deaf or hard-of-hearing. How do they communicate with staff? Tech to the rescue. 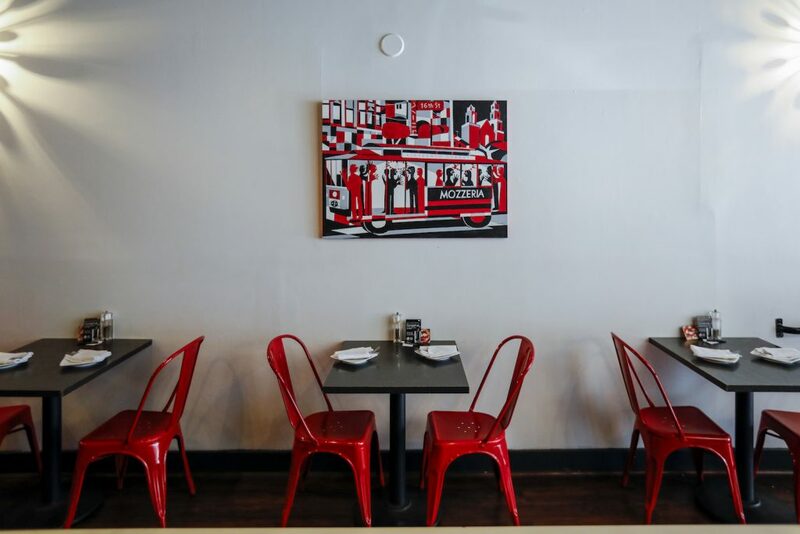 Because the restaurant operates in a tech-centric city, the use of CONVO, a video relay systems (VRS) for phone orders and reservations, makes Mozzeria easy to access for both deaf and hearing patrons alike. When a caller dials the restaurant, a VRS translator listens to the speaker and signs the message over the video call screen to a Mozzeria employee, who in turn answers by signing, which is then relayed by voice to the hearing caller. VRS is the same technology that was a part of Russ’s early career, so it makes perfect sense that Mozzeria would rely on the assistive technology. There are also low-tech solutions when guests dine in at the restaurant. Simply pointing is the way most guests order. There are also Mozzeria-branded pens are liberally strewn about the café, making it easy to jot down a question or a custom pie. And in the kitchen, all the staffers sign to one another, often offering a tap on the shoulder to get someone’s attention. Melody notes that some guests are surprised when they come into Mozzeria for the first time, but they soon get used to it. 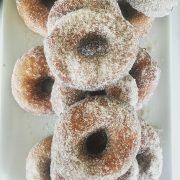 “Once they try our food, [patrons forget] about our being deaf and come in for the food,” she explains. “Eventually, they learn some American Sign Language,” such as the sign for “thank you”: a flat right palm lowered from the mouth. Teaching San Franciscans about the deaf community while sweetening the deal with delicious pizza is an integral part of Mozzeria’s mission. So on top of the pizzeria’s Mission location, it operates two trolleys, which sell pizza in different parts of San Francisco every day of the week. Usually, food trucks are how aspiring restauranteurs test their concepts before opening a brick-and-mortar bistro. 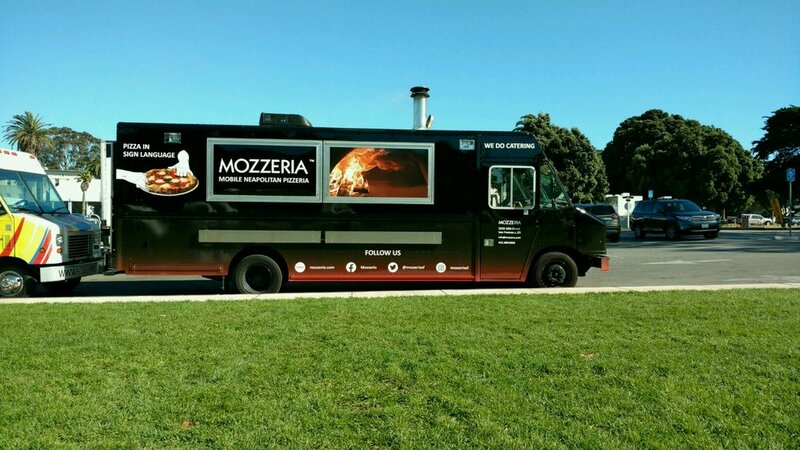 But with Mozzeria, it was the opposite: demand for the pizzas pushed the Steins to purchase the first of their two mobile pizzas trolleys in 2014 after customers wondered why a back-of-a-truck oven available couldn’t become a permanent fixture in a town wild for food trucks. One of Mozzeria’s mobile pizza trucks. Despite the fact that San Francisco is famous for its cable car street trolley system, the first trolley that became the Mozzeria mobile unit wasn’t located in SF—or even in California. Rather, the touring trolley built for short-distance tourist excursions was in Florida. Still, the Steins knew they had to have it. In a restaurant, customers come to you. With a truck–or, for that matter, a trolley–you can take your food to the people. A 3,000-mile road trip ensued, with stops at several deaf schools along the route home. “We shared our story with deaf students, encouraging them to dream big,” Melody explains. Before they took the wheel and drove it to California, the trolley had never been more than a 30-mile radius from its home base. By taking delicious pies to the people, the Mozzeria crew creates new opportunities to teach the local community about interacting with deaf drivers and chefs. 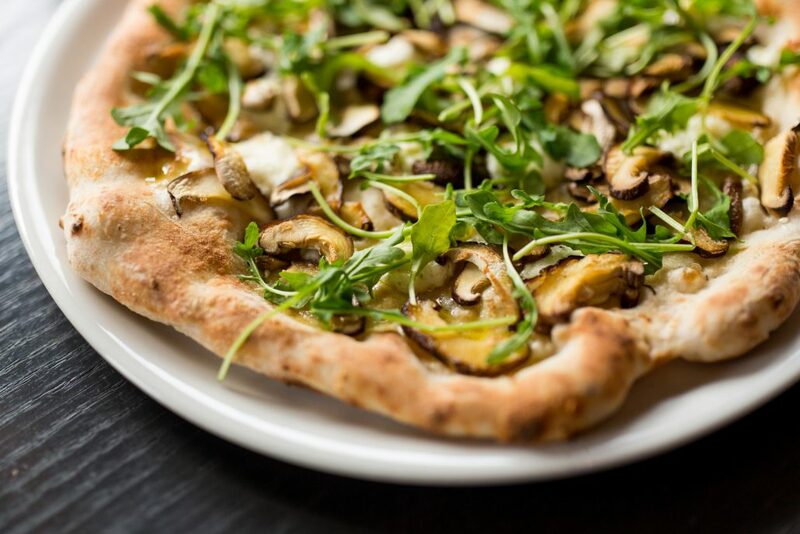 Slightly more limited than the brick-and-mortar pizzeria, the trolley’s deceptively simple menu offers a range of choices each marked by a letter. Patrons sign the letter corresponding to the pizza they want, a staffer writes the amount due on a white board, and a short wait later, a piping hot personal pizza comes out of the trolley-mounted oven. To make a mark on the notoriously oversaturated San Francisco food scene is no small feat, especially in a city where exclusivity and eccentricity are both highly valued. The community it was built to serve eagerly supports Mozzeria, but in the end, its recipe for success is serving the entire spectrum of Bay Area customers. Any way you slice it, that’s a well-rounded approach.